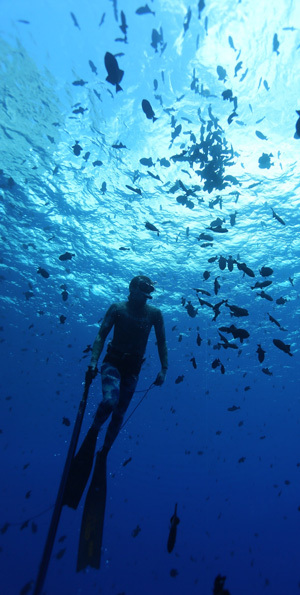 Spearfishing off Ascension Island, one of the ‘last out posts’ of the untouched world we live in, is truly a life changing experience. 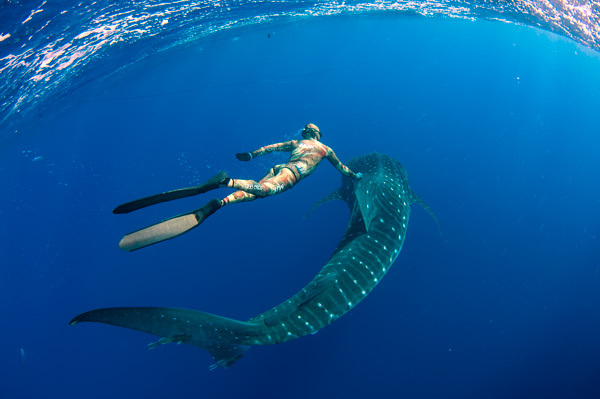 An experience that all other dive trips are measured against. 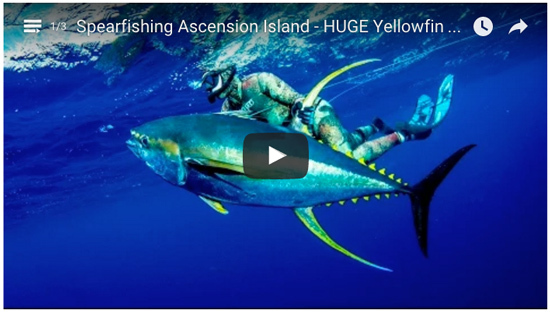 Ascension is arguably the best place in the world to shoot Giant Yellowfin Tuna, and it is only a matter of time before the world record is taken there. The island creates a massive feeding ground and hot spot for all sorts of pelagic fish. From Marlin, Wahoo, Dorado and Sailfish. For a moment you could think you were in the tropics. 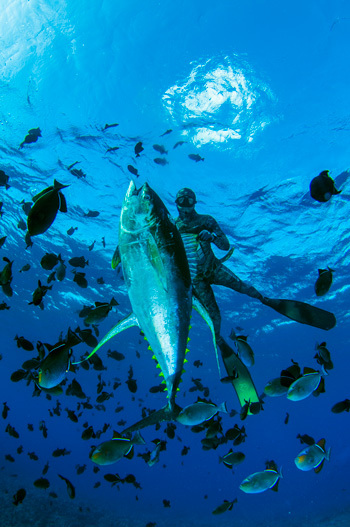 Now throw in giant Yellowfin and Bigeye tuna and you have a dream location for spearfisherman. Like anywhere in the world there are seasons for different types of fish. Late January – April is Marlin season with 1000lbs been caught every year. From March into April you can expect to find Sailfish. 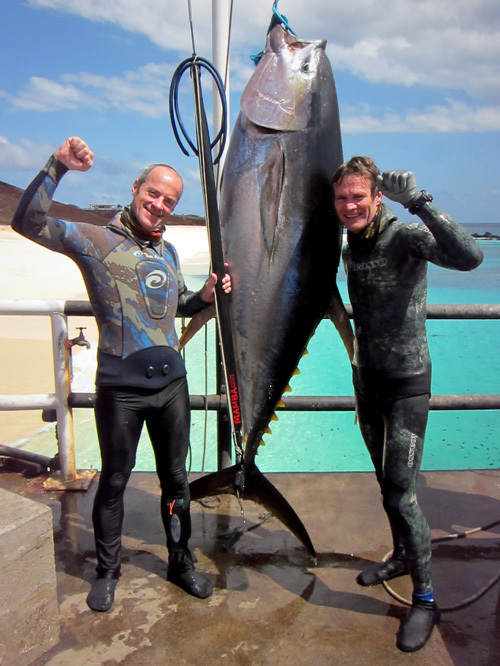 But the main attraction is from April – November when the Yellowfin tuna are in town. The later part of the season the big fish move close to shore to feed on the baitfish and giant tunas can be seen smashing fish in only a few meters of water. Ascension however has fish all year round and the Wahoo and Dorado can be found on FADs and hunting along the edges of the baitfish shoals. There is a need to have trips planned and run differently from what is been done on Ascension at the moment. We understand that spearfishing Ascension is expensive and this is why the guys go in groups to split the cost. This however does dilute the experience and makes it more difficult to land that fish of a lifetime that you traveled half way round the world to get. Our aim is to supply guys with a similar experience to what I do with my elite clients like MJK. These trips I do with him for example are expensive but he gets the exclusivity and all the benefits that go with it. One of the main benefits is that he gets a lot more fish, especially when at places like Ascension. This is primarily because he is not competing with 3 other guys, who are all falling over each other to get a shot in, and then blowing it for everyone. I have seen this over and over where the groups of guys don’t come home with fish or in some cases don’t even see the fish that we do. This is even with international guides who are supposed to be the best in the world. So I am not proposing to be a taxi driver taking you to the spot, dropping you off and hoping for the best. Our trips run with 1-2 divers who are joined by myself as a guide and pro photographer. Plus I will be using my own skipper / guide Steve Ellis who is not only an exceptional diver but has been doing trips to Ascension for many years and is probably one of the best guys on the water there. 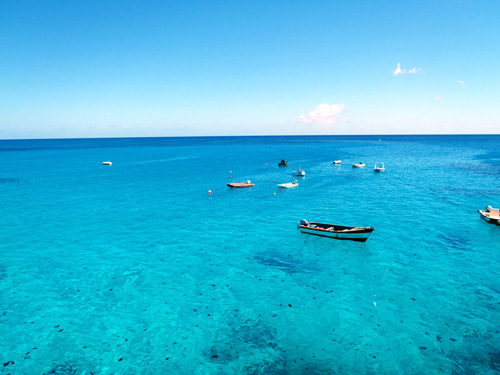 We will provide you with a walk on service where you just arrive and dive and we take care of all the logistics. We will have a vehicle there and we will do all of the running around. We will do all the hard yards with the chum (the right way) etc. and all you need to do is pull the trigger when the time is right. There is lots to learn about with this type of diving, but with the individual attention and coaching you will get from Steve and myself I believe you have the best chances at landing massive tuna. Your own private boat. Your own skipper and guide / pro photographer for 8 days diving. This means you get to pick and choose when and where you want to be. This will also give you the flexibility to do other things as well. You will be on the island for 10 days, in our experience there is normally a weather day or two, or a strategic day’s rest in the middle also works. There is lots to explore on the island and we would like to personally take you to go and experience some of these things while you are there. From the rain forest up Green Mountain, to the hidden coves and bays skirting the luna surface of Ascension. Guide in the water next to you at all times. Professional Photos in and out the water. Transport – we hire a double cab 4×4 which we will take care of all the fetching and carrying, as well as the additional adventures around the island. Personal tour guide making sure there is never a dull moment. Accommodation at the Obsidian hotel, plus meals. *You will notice that we have shown costs for a 3 diver team. We will consider this if the group is extremely tight, experienced and are willing to share and take turns. This might even mean getting into the water from time to time without a gun, this can be a bonus as you have seen the pictures I have taken with free swimming tuna. You can only get to Ascension Island via Brize Norten Airforce Base, in the Uk just outside Oxford. You would need to get from your destination to Heathrow which is normally an early morning flight in, catch a cab which is approx. £120 to Oxford (2hours drive). The military use a new Airbus A400 that flies: Brize Norten – Ascension – Falkland Islands return and has two flights per week at a cost of 900 pound per person return. There are only 15/20 seats allocated for civilians, so booking in advance is essential. Flights leave Brize Norten 11.30pm, and you have to check in 4 hrs before. Its a military flight so there is no alcohol served inflight, but meals are included. The flight 8 hrs and there is also no inflight entertainment so take your own iPad, laptop, book etc..
On landing at Ascension there is an Island Airport tax of £20 pound payable immediately. You will also need to show a valid Casuvac Policy to get yourself off the Island in a state of emergency. They have a small Hospital there for minor injury’s. You will also need visa that takes approx. 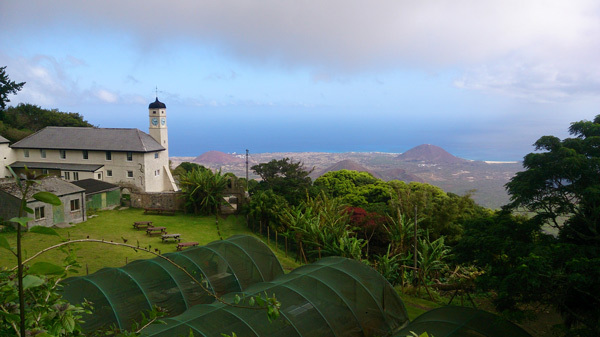 2 weeks to get from Ascension Island Travel. Other ways of getting to Ascension are via private Yacht or the RMS St Helena which calls by every 28 days from South Africa via St Helena, so you could get there by ship and fly out or fly in and leave by ship, logistically you needs loads of spare time but its an option. *The logistics to getting to Ascension can be arduous especially for first timers. For a fee we can assist you by taking care of all your flights permits and paperwork needed to get to island. The Obsidian Hotel is the only hotel. It has rooms, and outside chalets. (£ 50 – £90 bed and breakfast per night) http://obsidian.co.ac. There are self catering houses near the beach (£1165 for 15 days) need to book well in advance. Summertime on land its 36/38 degrees Celsius in the day, so light casual clothing is fine. The evenings warm, and the winter air temp is 32/34. Bring board shorts and lightweight long sleeved shirts or t-shirts to keep the sun off you. A pair of running shoes to protect your feet from the rocks and volcanic stones is advisable, and flip flops for normal walking around will be fine. The sun is strong so a wide brimmed hat or cap is essential. In the evenings a light windbreaker type jacket will be fine if the winds is blowing. There is the Obsidian Hotel which serves pretty good meals. On the US base there is a Mcdonalds type of restaurant that serves pizzas, hamburgers etc. The British Naffi restaurant that has similar food and pies and a good shop/small supermarket that sells loads of stuff catering for the British troops stationed there. A local supermarket in Jamestown sells most stuff, but fresh produce is dependent on the latest RMS St Helena delivery. There are a couple of bars selling some food & alcohol as well. All these place do run on strange times and are not always open, but we will give you the run down and take you to the best places. Between Steve and myself we also come with extensive knowledge and experience when it comes to gear. As you are probably aware I am a bit of a gear freak and am very passionate about different guns and rigs. I have been fortunate to have many extremely rich clients who are able to buy whatever gear they like, so I have tested pretty much everything there is out there. 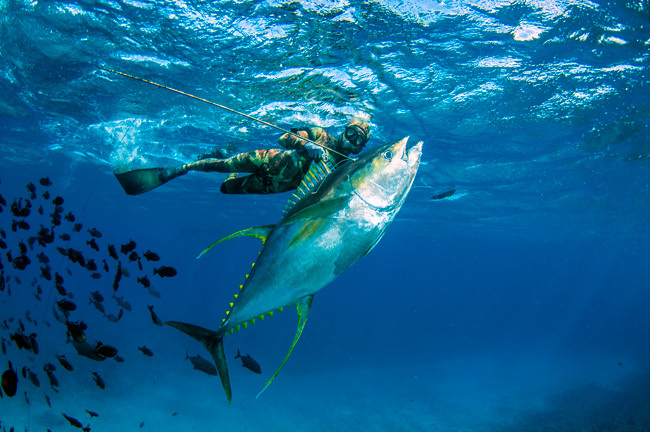 Steve comes with his own pedigree, and is the builder of the infamous ‘Mamba’ guns, which are probably the most successful guns, used on Yellowfin on the island. This means that before you even arrive we would have made sure you bring what you need to get the job done right. 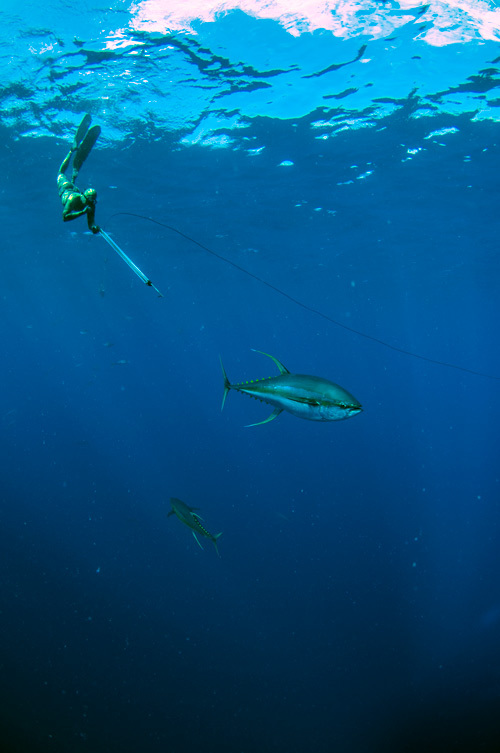 That said the std Yellowfin setups used are bluewater guns with 30m bungees and 2 35l floats. There is not much need for dropheads as the Yellowfin tunas skin is relatively tough, and barbed spears generally have better penetration. Most guys tend to go with 1500 double rubber guns and a 7.5mm shaft, although shorter roller guns are becoming more popular. Our personal setups for Ascension island spearfishing are: 1300 MAMBA rollerguns with 7.5mm double barb spear. This is attached on a breakaway to a 30m Rob Allen bluewater bungee and a single 35liter 1.5-2 atmosphere float. Riffe or Rob Allen are both good. On the wetsuit side a good 3mm wetsuit is perfect, waters warm 26/28 degrees Celsius in summer and 24 degrees Celsius in winter, but there is lot of wind and wind-chill. A light wind breaker jacket or smooth skin Chiclet suit is advised.